Everyday I cook, everyday I go through the trouble of thinking of what to cook. Can you relate? Well, today I made a lunch with last nights dinner. 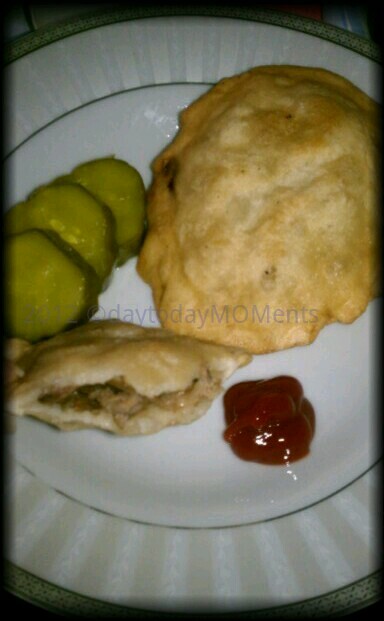 I made roast pork with vegetables, I had plenty left over, so I made them into patties today. Kneaded together some flour (King Arthur Gluten Free Flour and Bob's Red Mill All Purpose Flour Blend #glutenfree #wheatfree) with some water, placed the veggies and meat inside. Fried a bit on both sides. :) Was delicious and super easy to make too. Depending on what you can have, and like, you can add cheese and other ingredients for more fun. What did you have for lunch? Have you made anything like this before?